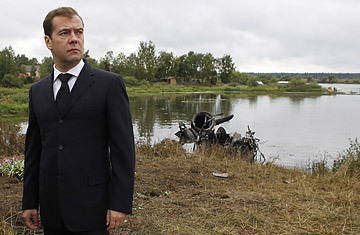 Russian President Dmitry Medvedev visits the site of a plane which crashed with the Russian ice hockey team Lokomotiv Yaroslavl on board, on the bank of the Tushna River near Yaroslavl, Russia. On Wednesday night, about a hundred livid hockey fans, dressed in the red and white jerseys of Lokomotiv, their home team, gathered outside the St. George hotel in the Russian city of Yaroslavl to vent their indignation at a group of officials visiting from Moscow. "Thank God they were blocked from coming inside," says Evgeny Minchenko, a Kremlin-connected spin doctor who was staying at the St. George. "Until two in the morning they were under our windows yelling, 'Shame! Bastards!' as well as some things I'd rather not repeat." For politicians, it was an awful omen for the election season now getting underway. The previous afternoon, a plane carrying the Lokomotiv Yaroslavl hockey team, which had won the national championship thrice, clipped an antennae tower during take-off and crashed on the embankment of a nearby river. Practically the entire team was wiped out, including 36 players, coaches and staff, some of whom perished in what witnesses described as a column of fire that rose nine stories into the air. Among the bodies pulled from the river, where part of the fuselage fell, were eight crew members. Two survivors  a player and a member of the flight crew  were rushed to the hospital in critical condition, their bodies covered in burns. In all, 43 people were killed. By coincidence, Russian President Dmitri Medvedev was due to arrive the next day, Sept. 8, to host a summit in Yaroslavl. Most of his senior advisers and cabinet members were due to attend, and with so much of the political elite converging near the site of the accident, the city's grief quickly morphed into a wave of anger at the visiting officials. The reason was not simply the crash of the Russian-made Yak-42. It would be senseless to blame the state for a single freak occurrence. It was rather the frequency of such disasters, which have been caused not only by slipshod safety regulations but, as Medvedev admitted on Thursday, a rotting fleet of Soviet-era machines whose condition the state has failed to manage. In the past three months, more than 200 people have died in a series of transport tragedies. The crash of a Tupolev plane killed 44 people in northeastern Russia in June. Three weeks later, a 56-year-old cruise ship sank in a reservoir, killing 125 holiday makers, including dozens of children. The next day, another plane crashed, this time an Antonov, killing at least six in Siberia. Now combined with the deaths of some of Russia's greatest athletes, these accidents have exposed the basic failings of the state just a few months before two crucial rounds of voting. In December and March, Prime Minister Vladimir Putin and his ruling party need a landslide to renew their legitimacy for at least a few more years in power. But as early as Thursday, members of Russia's opposition began laying blame for the Yaroslavl tragedy squarely at the government's door. "Putin has reneged on his social contract with the Russian people," Mikhail Kasyanov, a former prime minister turned dissident, told TIME in an interview Thursday. "He has failed to guarantee safety and peace of mind." Even members of the so-called "constructive" opposition, who are allowed to hold office as long as they don't undermine Putin's rule, took the chance on Thursday to ridicule the state. "It is 10 times more common in Russia than in any other civilized country for planes to fall, ships to sink, trains to go off the rails, satellites to get lost in space, and ballistic missiles to fail at take-off," chided Gennady Gudkov, a lawmaker for the pro-Kremlin Fair Russia party. This was, of course, part of a political maneuver  Gudkov's proposal was for his own party to help oversee the transport industry  but it pointed to a vulnerable spot in Putin's platform that has gotten even more so with every new catastrophe: If the ruling elite has brought such an era of prosperity, as Putin repeatedly claims, why do Russia's planes keep dropping out of the sky? "Without a doubt this will keep bubbling up during the election season," says Minchenko, the political strategist, who is now working on the government's campaign. "It is a very sore point for the authorities. And to my deep regret, it is not an issue you can simply sweep under the rug." Still, President Medvedev's response seems to be doing just that. In July, after the cruise-ship sank and two planes fell out of the sky in the span of a month, he ordered all vessels of the same type to be taken out of commission. But there was a problem. Airlines said it was impossible to ground the dozens of Antonovs and Tupolevs comprising their fleets. Experts agreed because there was nothing available to replace them. So the airlines were forced to keep flying the old rattletraps, and the issue was allowed to fade. Then on Wednesday, when it happened again, Medvedev looked stupefied. He once again ordered all planes of the type that had crashed to be grounded and all airlines who had failed to comply shut down. "We can't go on like this, with this fleet," he told his ministers, the same men he had gathered two months before to discuss the same kind of tragedy. "The value of human life is higher than all others, including the need to support our national manufacturers... If they cannot pull it together, we have to buy planes from abroad." Putin, meanwhile, stayed silent. His only comment was a dry, one-sentence statement released on Wednesday by his press service, saying that the Prime Minister "expressed his condolences to the relatives and friends of the dead." Clearly this was not enough to stop the grieving fans of Lokomotiv from gathering outside the St. George that night to curse the visiting bigwigs. "I saw a column of the fans marching the next day through the city," Minchenko says. "They looked pretty calm. So I came over and offered my sympathy, and they really seemed to appreciate that someone from Moscow cared." But as of Thursday evening, a group of riot police was still stationed outside the St. George, guarding the Kremlin elites as they hurried back to the capital. None of them, surely, will be using that image in their campaigns. See TIME's photogallery, "The Russians in Ossetia." See photos of Vladimir Putin: Action Figure.